There are currently 88,677 users on this website. Ville Schiltigheim (Alsace) has similar arms: dans ecu d'argent, trois merlettes, deux et une (three martlets, two and one, against an argent shield) topped by a French chapel-style helmet and scrollwork. This has a nice possible connection to yours since those arms were granted by royal decree to the city by none other than Louis XIV in 1697. NL: Een blaauw schild beladen met 3 vogels of kauwen van goud, geplaatst 2 en 1. EN: A blue shield emblazoned with 3 gold birds or jackdaws, placed 2 and 1. This coat of arms is the same as that of Jhr. Ravenschot, and the motto associated with Ravenschot/Ravenscot is INCERTVS CANTO CRAS -- attested in 1751 on a fresco panel at the monastery (now church) in Houthem, Sint-Gerlachus. (kz.) Incertus cano cras 1634 / Afbeelding het fraaije wapenschild van E Ravenschot zie hetzelve op de leg penningen bij VAN LooN 2 d pag 227. sommige handschriften hadden camo en canto." 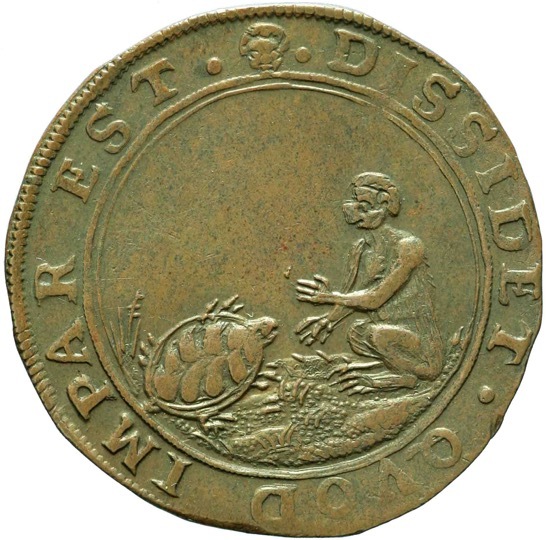 "DISSIDIT QUOD IMPAR EST / Image of a monkey sitting by a turtle"
"INCERTUS CANO CRAS / Image of the fine (?) 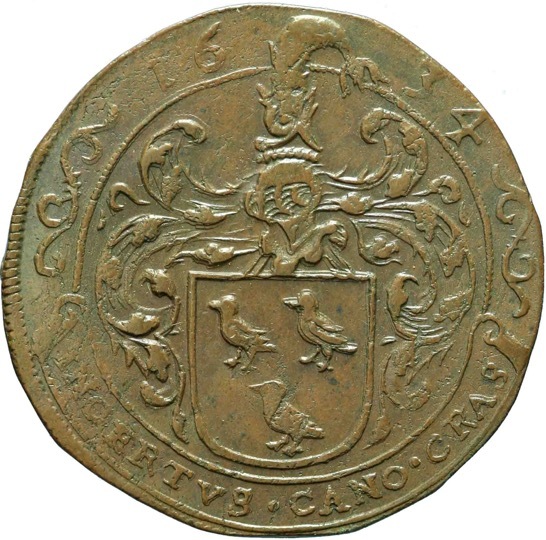 coat of arms of E. Ravenschot as seen on the lay-pennies (?) in Van Loon's 2nd folio, page 227. Some manuscripts had 'cano' for 'canto.'" Okay, INCERTUS = unclear or uncertain, CANTO = song, but CRAS..well, how about CRASTINUS, i.e. on the morrow/tomorrow? That makes more sense to me. That also dates your "historiepenning" to 1634. I'll post more if I run across more interesting information. excellent suggestions, Paralyse, thanks for your analysis ! Engelbert van Raveschot was member of the board of governors of the city of Brussels in the period 1610-1650. The city hall of Brussels (one of the most beautiful gothic buildings ever built) has an interesting painting "La Vierge aux magistrats" made by Anton Sallaert in 1634, the same year as the coin of this post. The magistrate on the right is Engelbert van Raveschot with the coat of arms of the Raveschot in front of him. 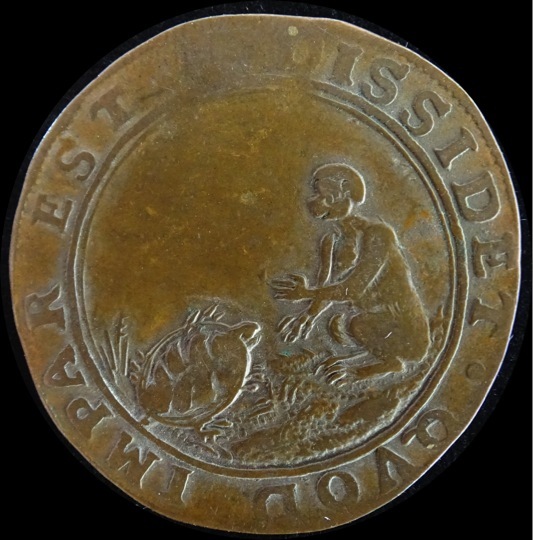 several reached in very short time : date, references for this coin and person who is behind its production. 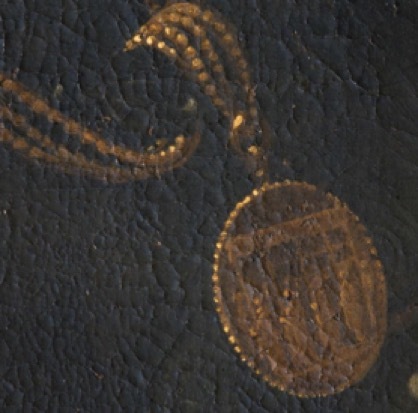 To me this jeton is an example of a personal device (a heraldic badge) as seen throughout Europe in the 16th & 17th c.
Usually, one side would feature the coat of arms of an individual or his family or lineage. The other side would have a short motto or inscription and an engraving or image. The image and motto were supposed to reflect on a perceived quality of that particular family, in either a straightforward way or as a puzzle / rebus. Sometimes the images were allegorical in nature: a musical instrument might symbolize "harmony", a shepherd and sheep "peace", a knight in a suit of armor "virtuousness", a religious motif or Biblical scene for "piety", a sword and shield for "military prowess", etc. Other times animals were used as a theme based on the perceived qualities of those animals, realistically or in the manner of fables: a beaver for industrious/hard working, a wildcat for ferocity, a fox for craftiness and cunning, a squirrel for frugality, etc. I agree ! For The Netherlands, such heraldic jetons were especially popular in the Southern Provinces during the 17th century. 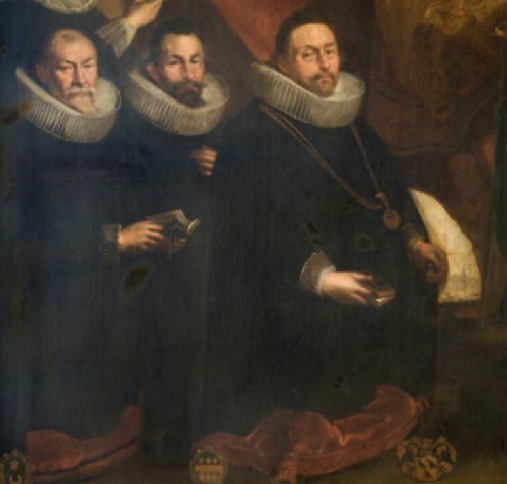 We should go back to the painting of Anton Sallaert from 1634: Engelbert is wearing a medal. This is very interesting, one of the few examples of a "snapshot" of a first owner of a medal, wearing it on a special occasion. 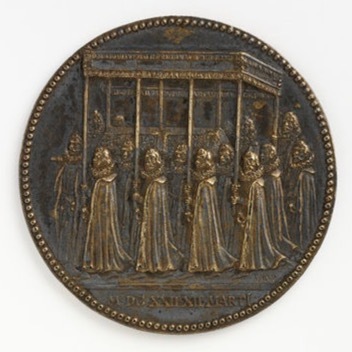 This medal (made in 1622 by the Flemish medallist Waterloos (1600-1684)) is a memory to funeral of Archduke Albert of Austria (1559-1621), Governor of the Low countries. A very rare piece only given to persons in the close circle around the archduke. One of the few surviving pieces today is present in the Victoria and Albert Museum in London (museum no A.395-1910). Engelbert van Raveschot was member of this small circle, perhaps not important enough to be one of the men to carry the coffin of the archduke, but one of the nobility present at the funeral procession. This memory apparently seems important to him. 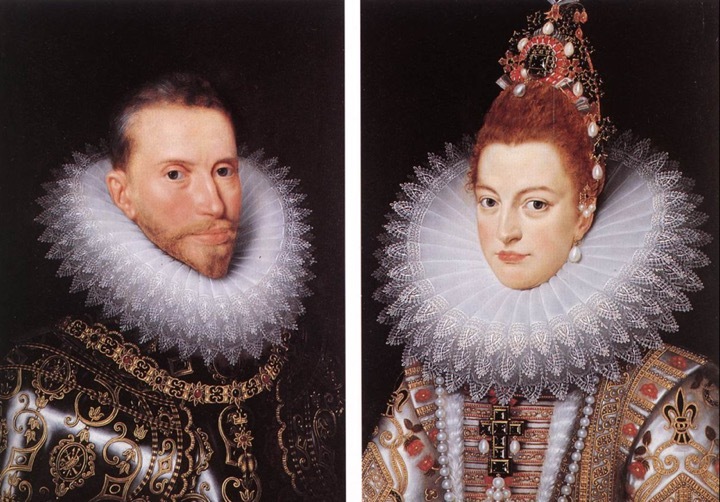 I wrote before in another thread http://goccf.com/t/301479&whichpage=55#2757378) that the two Archdukes, Albert of Austria and Isabella of Spain, were immensely popular in the Southern Netherlands where they brought back prosperity and "oxygen" for normal life. In the decades before the marriage of the archdukes (1599) the Netherlands were ravaged by the most savage manifestations of war (massacres of whole cities, numerous sieges, looting etc etc) destroying one of the most wealthy societies of that age. The reign of the archdukes Albert and Isabella brought new hope in the country. So there were good reasons why the everyone loved the archdukes. van Raveschot understood that the 80-years war had ripped the 17-provinces of the Netherlands apart beyond repair; the result was final: a Southern entity (the Spanish Netherlands) and a Northern part (the Dutch Republic). In particular the duchy of Brabant, where Engelbert van Raveschot lived, suffered badly for seven decades (three generation !) and was split in Northern Brabant and a Soutern province (this is still the situation today). May not together well pared bee. Flyeth from the Torteise (no mans ioy) amazed in this sorte. It is because they differ much in disposition sure. Unto that Rusticque clowne which late, your frendes desyrde consent. Whose nature differs lesse from youres, then myne; or else take none. When my interpretation is true, it means that Engelbert van Raveschot has a visionary idea. Between this jeton and final peace agreement it took another 14 more years of war before all parties agreed that separating the two species was the best option for all. 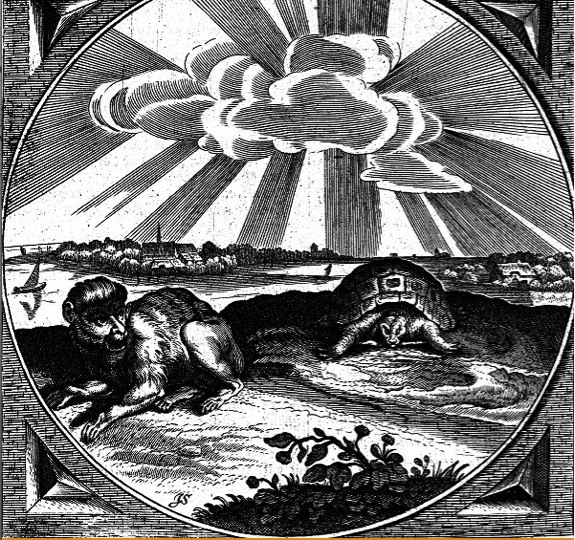 The treaty of Muenster (1648) officially ended the 80-years war between the Netherlands and Spain and made it possible for the turtle and the monkey to live as peaceful neighbors. Thank you, Paralyse and thank you Paul van der Zee, for helping me to dig into the history of this mysterious little piece of copper. As with the jeton of Calvin and Servet, this type of digging makes coin or medal or jeton collection a wonderful hobby! 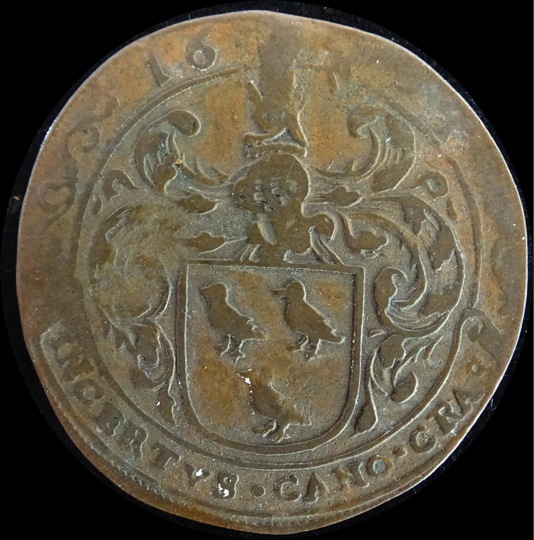 A coin of cats and raven, which do not go very well together, but thrive separated in the obverse and reverse sides. A very interesting journey. Well done. 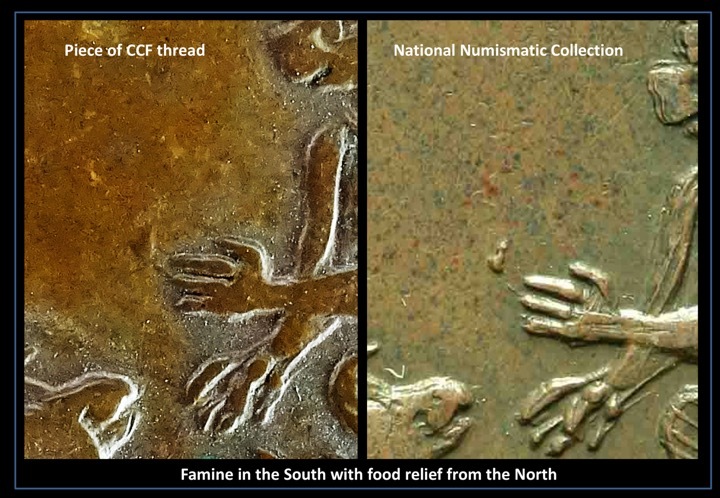 This second jeton (Dugniolle 3902) is described by Gerard van Loon (II, page 223) in the context of severe famine striking the Spanish Netherlands in the years 1634 and 1635. But in 1636 good fortune returned to the Southern provinces. The severy famine in 1634 may explain the feeding detail (compare the two jetons below). A detail I did not mention before is that Engelbert van Raveschot was magistrate of the city of Brussels not only as echevin (schepen) but also as supervisor of the economically important canal (dug between 1550 and 1560 between Brussels and the Scheld river), providing a food chain between Brussels and the port of Antwerp. Dolphins are used in heraldry in connection to the sea. Very interesting discussion. Coins are new to me and I was not aware of such personal jetons. Maybe I can contribute to the identity of the former owner of this object: Engelbert van Ravenschot. He was a member of a well-known family of Leuven, in the Southern Netherlands, that moved to Brussels in the 16th century. His father Charles, counselor and echevin in Leuven, married a van der Noot, one of the most prominent families of Brussels. 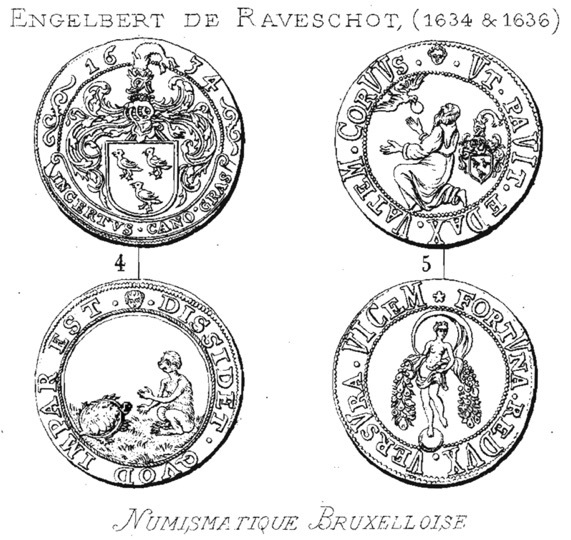 Englebert was incorporated in Brussels' ancient lineages in 1598 (= families stemming through paternal or maternal line from the 7 families that dominated the city in the middle ages, giving them the right to participate to the city's government). In Leuven, the family was also admitted in the ancient lineages and occupied posts in the government. A Ludovicus Ravescot, printer in Leuven in the period 1485-88, is renowned for its high quality bookbinding. In one of the posts above Engelbert van Ravenschot is confused with Hubert Engelbert van Raveschot who lived on the castle of Ruwenberg near s'Hertogenbosch in North-Brabant. These are different persons belonging to distinct families, despite the fact that they bear similar coat of arms. The same applies to the prominent Raveschoot family from Ghent (13th-16th century) : although in ancient genealogical manuscripts all these families are presented as one, these documents are full of obvious mistakes and do not present any verifiable evidence. My research so far indicates that there is no obvious connection between these families, although I have not researched the origin of Northern Netherlands Raveschoot to a sufficient extent. The coat of arms of knight Adrian van Raveschoot deceased in Ghent in 1506 are the same as those on this jeton, including the dolphin on top. I suppose that the Raveschot's of Leuven/Brussels have exploited the fame of their homonyms of Ghent to support their own fame and nobility status by adopting the same coat of arms. The three ravens on the shield can suit any 'Raveschoot' family since 'Rave' stands for 'raven'. 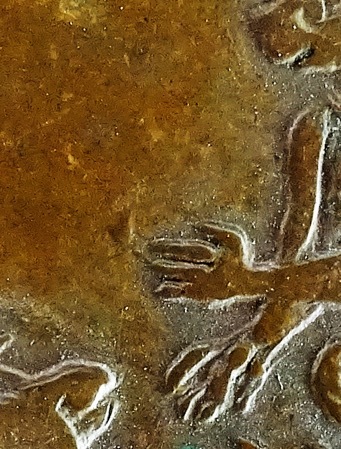 perhaps this profound change in The Netherlands and a longing for stable peace after so many decades of conflict inspired the Brussels magistrate Engelbert van Ravenschot to produce this particular little copper jeton.